Has Spring Cleaning Fever Struck You? The other day the sun was shining, the temperature was rising, and I had the urge to do some deep cleaning. Now, considering that spring cleaning fever doesn’t strike but more than once a year, I decided to take full advantage of the moment! I realized I couldn’t, of course, clean the whole house (even though it desperately needed it), so I decided to focus on the family room and make my life easy by using time honored green cleaning techniques that were healthy and safe for my family, not to mention the planet. The one essential ingredient I needed to get started — vinegar — was in my own kitchen cupboard. But I needed more than that, so I raided my rag stash and grabbed a few essential supplies, such as an empty spray bottle and bucket. In under five minutes, I whipped up an all-purpose vinegar spray, which I would use to freshen the air and clean my entire family room — windows, tables, wooden furniture, woodwork, walls, media equipment, and more! I also had some essential oils on hand, so I decided to add in some orange and peppermint essential oils to my creation to keep me motivated! By the way, the great thing about using one product like the vinegar spray is that it’s easy, cheap, and effective. Plus, it makes your cleaning go sooooo much faster! You can simply move around the room in a circle as you clean with the spray bottle and your rags. No need to stop and switch out supplies, except for dirty rags, which I put in a plastic bag as I clean. To finish my cleaning extravaganza, I added a little vinegar to a bucket of hot water and mopped away! The vinegar worked beautifully at disinfecting and removing dust and grime by the way. What made it all worth it was when my kids came home from school and actually thanked me for cleaning, saying how nice the room looked! Believe me. That doesn’t happen that often, but I sure took the complement as “fuel” for future cleaning projects. Hmmm. Maybe I’ll tackle the laundry next, and use vinegar with some lavender essential oil to make an awesome, natural fabric softener and laundry rinse….Then, I’ll clean the bathrooms with vinegar…Maybe, I’ll then use it in the kitchen with a natural baking soda cleanser to clean my oven, stove, and sinks….OK. You’ve got the idea, right? 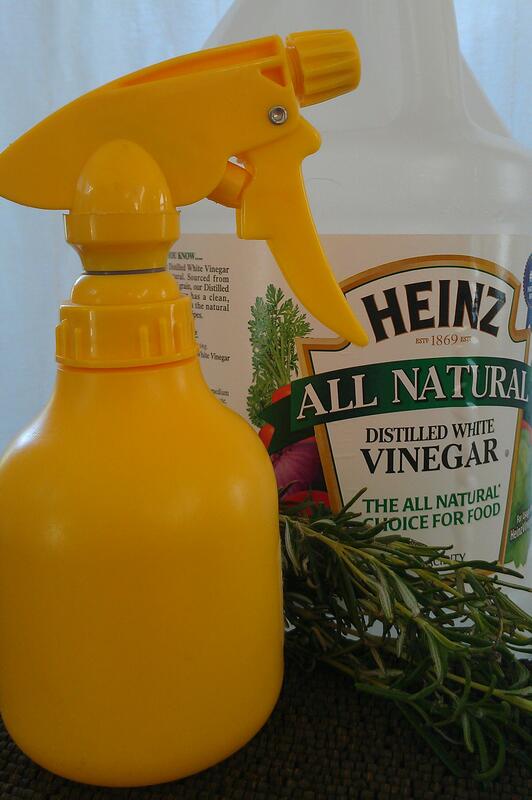 You can use vinegar to clean so many things in your house! So, how about you? Have you been struck by spring cleaning fever? If so, why not start by cleaning one room in your house, too? And why not give vinegar a try? Or, perhaps you have another favorite product you like to use and want to share? Copyright © Karen Peltier and Well Gal, 2013. All rights reserved. Photos © Karen Peltier and Well Gal, 2013.